At Samsung’s June 12th press event, the company announced a new line of tablets called the Galaxy Tab S that will be available in 8.4″ and 10.5″ sizes, both of which are only 6.6mm (0.29in) thick and include Super AMOLED displays with 1600 x 2560 resolution. The larger tablet weighs only 465g (1lb), while the smaller one weighs 294g (10oz). They’ll be available in “dazzling white” and “titanium black” sometime in July with a price point of $399 and $499 for the 8.4-inch and 10.5-inch models respectively. The Super AMOLED displays are the first of their size used in a mainstream tablet line. While Samsung’s Galaxy S phones have had Super AMOLED displays for a while, the tablets have been stuck with LCDs. Which you like better comes down to personal preference Buying A New Smartphone? How To Understand The Hardware Specs Buying A New Smartphone? How To Understand The Hardware Specs There was once a time when buying a cell phone was like buying a CD player. Over time, however, phones have become miniature computers – and the specifications are nearly as complex as a PC's. Read More — many people enjoy the dark blacks and bright colors of AMOLED, but others think that AMOLEDs blow out the colors too much. While LCDs need to light up the entire screen to display anything, AMOLEDs can turn on or off individual pixels, allowing them to claim better power consumption and darker blacks. Samsung is also boasting 11 hours of video playback, a feature called SideSync that allows you to control your Galaxy S5 from your tablet, a digital magazine app called Papergarden (thanks to a partnership with Condé Nast and National Geographic), and a fingerprint scanner that works in conjunction with Android’s multi-user feature to allow up to 8 people to log in to their own individual profile. Additionally, the Tab S series will see the return of Multi Window, which allows the user to run multiple apps at once, and Galaxy Gifts, which gives the user access to a bunch of free promotions — like 50GB of Dropbox storage for two years or a 6 month trial subscription to the Economist. 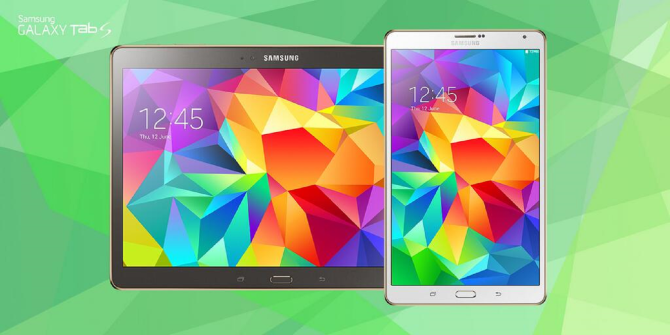 Will you be picking up a Galaxy Tab S when they become available? 6 Essential Apps for Photographers on Android and iOSSunrise Calendar Is Now Cross-Platform — But Is It Any Good? AMOLED displays make me paranoid about screen burn. I've seen it on PLS displays, even. Apple gets it right when it comes to displays. HTC's are good too. You can't properly edit photo's on an AMOLED screen. When viewed on another device, the pictures will look all wrong. Why would you do any editing more serious than cropping or re-sizing a photo on a mobile devices? I believe that the video says "titanium bronze" and not "titanum black" as the article says. I'm sure I'll wind up with one. I don't buy tablets. They just appear in my life somehow as a side effect of my job. That said, the specs on these are positively drool-worthy. 15% lighter than comparable fruit-based products. 25% more pixels (and in a more media friendly 16x9 configuration). 3x the RAM. I haven't seen the screen but it's typically something that even Samsung's lower cost devices do well. For the time being, this does seem to be the tablet to beat. My favorite tablet form factor is the 8 - 9" range. Big enough to have a high-resolution screen and light enough to be easily carried all day long. The one concern I have here is what the real-world battery life will be like on one of these given the new display technology.